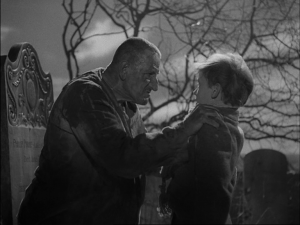 Great Expectations was the first of David Lean’s two adaptations of Dickens’ classic novels (Oliver Twist followed in 1948). The film tells the story of young Pip (Tony Wager), a good natured orphan, who lives with kind blacksmith Joe Gargery (Bernard Miles) and his often abusive wife “Mrs. Joe”. Whilst visiting the graves of his deceased parents he meets an escaped convict named Abel Magwitch. In fear for his life Pip agrees to get the man some food before he is discovered and captured again. Pip’s fortunes appear to change with the arrival of Miss Havisham (Martita Hunt) in his life. A tragic recluse, Miss Havisham lives in one room in her large house surrounded by memorabilia from her ill-fated wedding. Inviting Pip to her home to amuse her, she encourages her spiteful daughter Estella to break his heart. Eventually Pip (John Mills) attracts the attention of a mysterious benefactor who pays for him to travel to London and learn to be a gentleman in the hope of him achieving his “great expectations”. Restoration House in Rochester was Dicken’s inspiration for“Satis House”, the decaying mansion of Miss Havisham. Faithful to Dicken’s, the production carefully reproduced Restoration House in Denham Sudios in Buckinghamshire. Restoration House is the amalgamation of two medieval buildings that were combined in the 16th or 17th century. A Grade 1 listed building, it is rumoured that Charles II stayed there the night before he was restored to the throne, thus giving the building its name. The River Medway and the adjacent St Mary’s Marshes appear in scenes where Pip and his friend, Herbert Pocket, row their boat to a small inn whilst waiting for the Paddlesteamer to arrive. Their boat later crashes into the Paddlesteamer in one of the most dramatic scenes in the film. The Paddlesteamer used in the film is called the “The Empress” which was owned by Weymouth Company Cosens & Co and brought down to Kent especially for the shoot. It is often confused with the Kent based “Kingswear Castle” Paddlesteamer that featured in the BBC 1999 drama of Great Expectations and the 1998 drama of Our Mutual Friend. The Kingswear Castle is still in use today and offers members of the public tours along the river starting at its base at The Historic Dockyard in Chatham. Sheila Townsend’s Grandad, Jimmy Ennew, was a freeman of the river Medway and rented his row boat ‘The Ivy’ to the production team for filming. Sheila was 14yrs old at the time and remembers the excitement of sitting on the pier watching the filming. Although the film features several important Kent locations, the novel on which the adaptation was based showcases many more. The church where Pip visits the graves of his deceased parents and has his first terrifying encounter with Magwitch was based on St James’ Church in Cooling. In the novel, Dickens mentions 5 lozenge shaped graves where Pip’s brothers were buried. It is believed that he was inspired by the 13 graves of the same shape within the church graveyard. The tranquil park behind Rochester Cathedral, once a vineyard planted by monks from St Andrews Priory, is a convenient route for modern day tourists visiting the Cathedral to visit Restoration House in Crow Lane. In Dickens’ time the location was an open space and in his Great Expectations novel he chose it to form the last part of Pip’s regular route to visit Miss Havisham and Estella. Dickens based the character of Miss Havisham on an old woman who was his neighbour at his childhood home of Number 2 (now number 11) Ordnance Terrace in Chatham. Great Expectations was released in 1946 and is available on DVD. This entry was posted in Filmed in Kent and tagged Bernard Miles, David Lean, Great Expectations film locations, John Mills, Martita Hunt, St Mary’s Marshes, The River Medway, Tony Wager, Valerie Hobson. Bookmark the permalink.